2016 GDP growth in Poland was a disappointment on almost every front: the biggest in investments and exports, but consumption was also surprisingly meagre given the strong labour market and new generous child benefits. We expect to see a V-shaped recovery in the coming quarters, with the bottom of the cycle at the end of 2016. The private consumption should be the main driver of growth in the near term, boosted by lagged effect of 500+ scheme, with stronger exports joining during the year and investment recovery gaining momentum in 2H17, as the absorption of EU funds speeds up. However, in general, the GDP growth will remain rather sluggish and should stay visibly below 3% in 1H17, with the entire year result at 2.7%. After 28 months of deflation, CPI growth has reached zero in November 2016 and is likely to jump to c.1.5% y/y at the start of 2017. Despite the tightening labour market and less deflationary global environment we do not expect to see a big increase in underlying price pressure in Poland, especially when the GDP growth is subdued. The new Monetary Policy Council kept official rates on hold in 2016 despite persisting deflation and disappointing economic growth. Now, when deflation is over, the monetary easing seems even less likely, as the central bank sees GDP growth slowdown as temporary, and believes that rate cuts would harm the financial stability. We think the MPC is likely to keep rates stable for the whole 2017 and the next step would be a hike, but not before 2018. On the fiscal front, we expect to see more good news (fiscal deficit in 2016 is going to be much lower than planned, possibly near 2% of GDP) long before things will get a bit worse. Moreover, the main risk for 2017 fiscal balance is on the local governments' side, as higher investments are likely to produce the deficit. Meanwhile, the central budget should remain under control. Overall, the general government balance might be slightly above 3% of GDP in 2017. A significant further slowdown of GDP growth at the turn of 2016/17 (GDP below 2% y/y) should anchor the front-end of the yield curve, even if at the same time we are to see a gradual increase in the headline inflation rate. Later during the year, the front-end may start pricing in hikes by the MPC that will materialise in 2018. We expect the long end of the Polish yield curve to remain under pressure of policies of main central banks abroad. Moreover, the long-term debt might be under pressure from the continued risks tied to politics. All in all, we believe that the Polish curve will steepen further as the front end should outperform other sectors. In our view, the risk premium for Poland's assets should remain quite high, with the 10Y spread over Bunds oscillating slightly above 300bp. 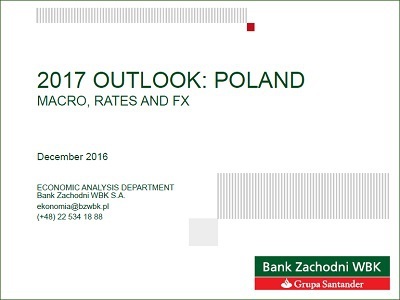 The Polish currency is likely to gain next year, particularly in the second half of 2017 when economic growth revives. In the short term, zloty may stay under pressure when the GDP hits the bottom. Apart from the pure economic cycle, we think that cash flows could also provide some support for the zloty – gradual revival of exports, sustained trade surplus and low C/A to GDP ratio.